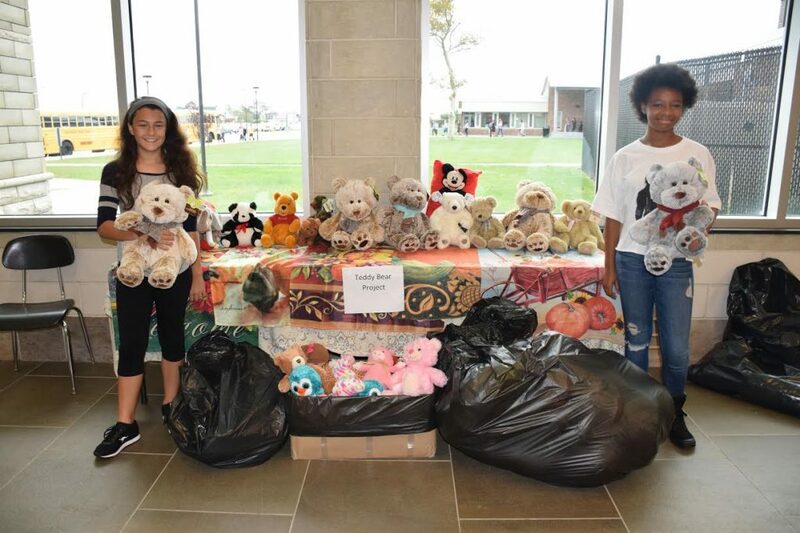 Long Beach Middle School seventh-graders Kayla Cadou and Kelis Walsh organized a stuffed animal drive to bring comfort to students at the College Road Early Childhood Center in Wilmington, North Carolina. The area was impacted by Hurricane Florence in September, and after experiencing the devastation brought on by Superstorm Sandy in 2010, the Long Beach students had a strong desire to help. Kayla and Kelis developed the idea for this initiative as part of a goal-setting assignment in their Home Economics class and decided to expand it to involve the entire school. Principal Paul Romanelli put them in touch with the CRECC Principal Rachel Greer, who was appreciative of their outreach. They explained how much they were affected by Hurricane Sandy and expressed that the loving support they received from other communities as they rebuilt left them eager to pay it forward. The two girls spread the word amongst their peers and teachers and made morning announcements to help promote it. Approximately two weeks later, they had collected numerous boxes and bags filled with teddy bears and other stuffed animals that they hope will make the North Carolina children smile.